During this spring and summer there will be construction at the trail end intersection as well as along 136th Street in order to allow for safer pedestrian traffic here. A crossing guard halts a car at the intersection at the end of the trail. Sergeant D.J. Schoeff said pedestrian visibility is the school’s focus. Additionally, Farrand said the widening of the median will result in narrower lanes at the intersection on that stretch of 136th Street. According to Sergeant D.J. Schoeff, the narrower streets there will complement the enhanced safety measures provided by the new push-button-activated crosswalk lights. re going to do by increasing the center median, a natural response to that decrease in lane width is cars moving slower. When they change that lane width down, it is going to slow the speeds of the cars,” Schoeff said. Cars drive past the intersection where students are crossing. Sergeant D.J. Schoeff said the school plans to make car lanes narrower. Farrand said there will be construction on 136th Street in the spring, but the construction closer to the school is scheduled to be completed during the summer when students will not use the trail as much as they usually do. 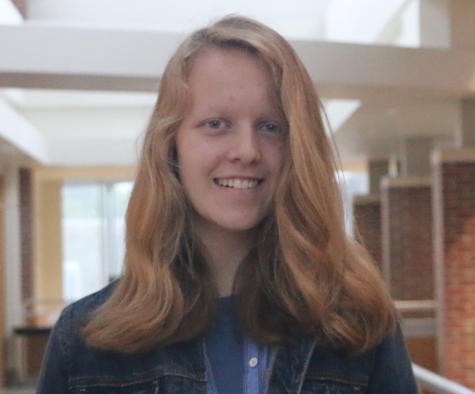 Sophomore Emma Domke, who said she has only recently started driving herself to school, said she did not feel intimidated or unsafe when crossing the street for her first few times using the trail. She said the new construction is not necessary, but is an added measure to make that intersection as safe as possible. Domke said, “I feel pretty safe (crossing the street) because the crossing guards do a pretty good job keeping the cars away. 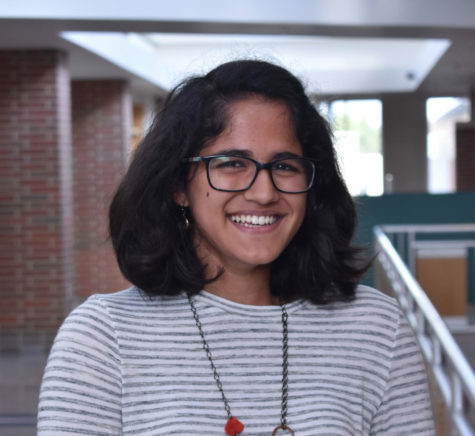 I’ve never seen a car hit a student, so I think we’re okay.” This project, according to Farrand, was inspired by other ongoing crosswalk projects around Carmel. He said the city was initiating projects to make the crosswalks more defined and the pedestrians more visible, so likewise the administration here started to improve the trail’s crosswalk. 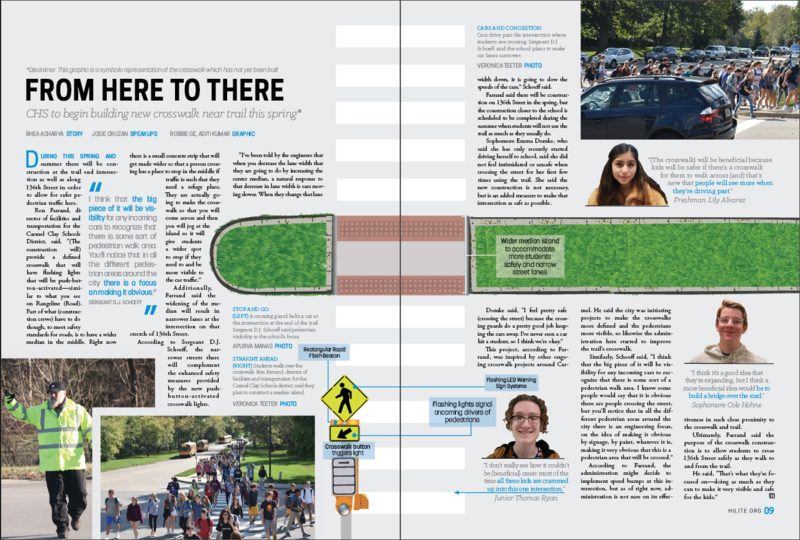 According to Farrand, the administration might decide to implement speed bumps at this intersection, but as of right now, administration is not sure on its effectiveness in such close proximity to the crosswalk and trail. 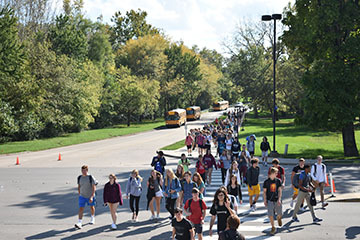 Students walk over the crosswalk. Ron Farrand, director of facilities and transportation for the Carmel Clay Schools district, said they plan to construct a median island. Ultimately, Farrand said the purpose of the crosswalk construction is to allow students to cross 136th Street safely as they walk to and from the trail. I am glad to see improvements to the visibility of this area. 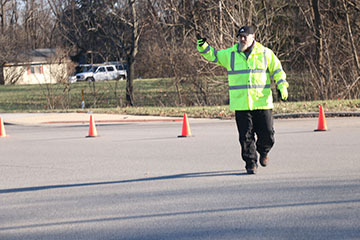 Students are crossing before and after the crossing guards are in place each day, often in the dark. 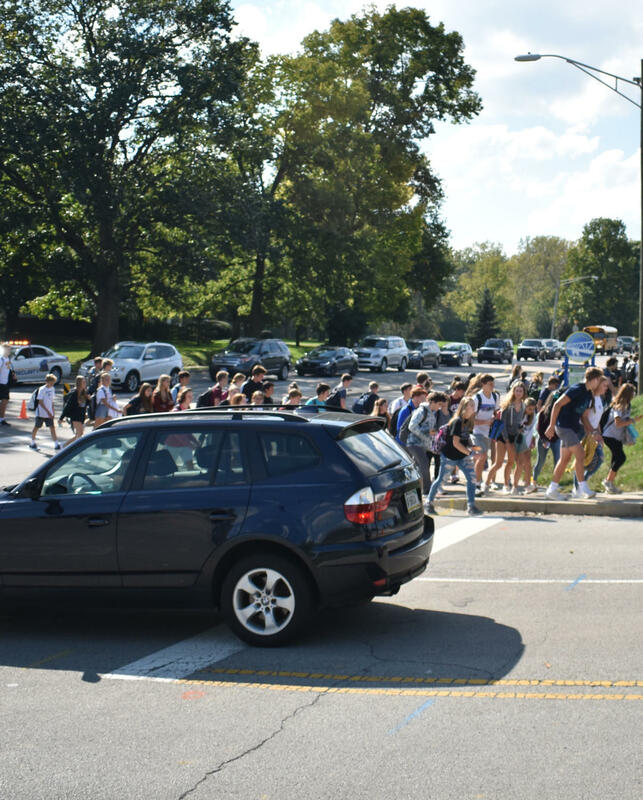 Would really like to see a crosswalk that is elevated over the street for students to use that permits traffic to keep moving and students to cross without issue. Has an elevated crosswalk been considered?